Almost 365 days passed before Romulus teachers realized what teamwork and unity could really accomplish. 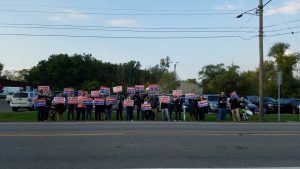 Led by a strong executive board and committed crisis team, with unwavering support from neighboring locals in Wayne County Multi Association Bargaining Organization (WC-MABO), the Romulus Education Association finally reached an agreement with the school board. In November 2017, Romulus’s collective bargaining agreement expired and negotiations began. Two meetings later, the REA requested mediation as it became evident that it would be difficult to reach a fair and equitable agreement for all. A crisis committee was in place and immediately began moving forward with plans to unite the staff and gain community support. To show solidarity, the crisis committee coordinated teachers wearing black on Mondays, orange (our chosen crisis color) on Wednesdays, and REA-created buttons every day with messages such as “RESTORE RESPECT,” “MAKE US WHOLE” and “PAY TEACHERS, NOT LAWYERS.” Multiple methods of communication, such as Instagram, private and public Facebook pages, personal e-mails, and text messages were employed to communicate with REA members and other stakeholders. 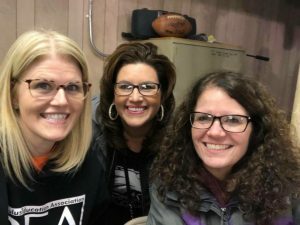 Romulus Education Association leaders (L-R) Vice President Julie Hirchert, President Sarah Carter, and Secretary Treasurer Julia Salerno say persistent collective action resolved stalled contract talks. All Facebook profile photos were changed to the orange REA logo, and orange decorations were present at conferences and school-wide events. Signs sporting the same slogans and colors were created by teachers and displayed in cars during picketing and at school board meetings. REA members were asked to write and deliver speeches at school board meetings addressing our top concerns. All school board meetings were broadcast live on the public REA Facebook page. The Romulus teachers continued their fight throughout the remainder of the 2017-18 school year as their negotiating team met with district representatives 19 times with no resolution in sight. 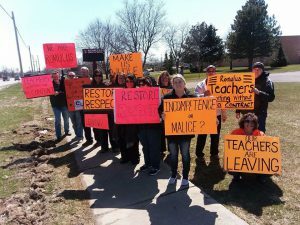 Beginning the 2018-19 school year without a contract, the teachers again prepared for battle. The REA made a decision to interview and endorse school board candidates as four open seats on the school board were open in the November elections. Teachers continued to picket, attend and speak at school board meetings, and show their solidarity by sitting in silence at the welcome-back-to-school meeting led by the superintendent. Early in September, a concerned parent contacted Channel 4 News, and REA President Sarah Carter was interviewed to verify the facts. This story aired on all evening and morning newscasts and was shared via the REA public Facebook page, eventually being shared more than 550 times and having over 45,000 views. Within a week of the news story, the school board president resigned and the superintendent had no choice but to apologize to the community for her lack of leadership. With momentum in their favor, the REA moved forward with a vote of no confidence for the superintendent. The vote was held in October with the support of the WC-MABO, a group of local associations that bond together to support one another in efforts to bargain fair contracts. In a show of solidarity, members from many other WC-MABO districts picketed and attended the next RCS school board meeting and Joe Ligaj, WC-MABO Chief Negotiator, spoke on our behalf. One week after the vote, the new acting school board president set up a meeting with the REA president and WC-MABO Executive Director. After two sessions and a total of ten hours of discussion, a tentative agreement was signed. As Thomas Edison once said, “When you have exhausted all possibilities, remember this: you haven’t.” The Romulus Education Association is a great example of how unionism, perseverance, and taking risks can overcome adversity. The fight continues.